I love this color! While I was applying the first coat, it was a little goopy (I think from the Wet n Wild black creme) so I decided to take it off but finished up a quick second coat for pictures (very sloppy too). I have no polish thinner! Cool! What did you use to make it? 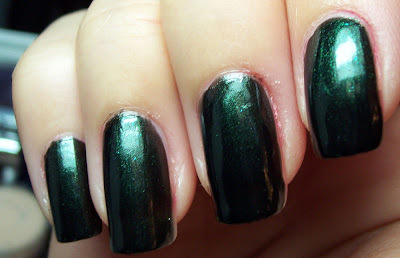 I used 1 part black creme 1 part clear and about a teaspoon of a green pigment sample I got from Everyday Minerals. Pretty color. 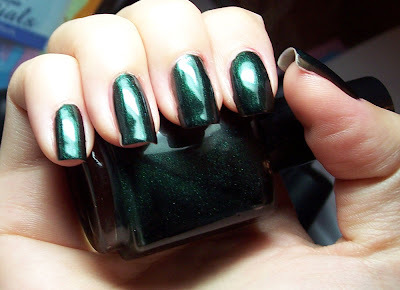 You freehand art on your nails, do Konad and now franken polish. Pretty good Kae!